Drivers and bus riders appeared to be adapting Monday as hundreds of bus trips were redirected from the downtown transit tunnel to surface streets, where they merged with existing car and bus traffic. Bus commuters used to catching their ride in the tunnel found new stops on surface streets during the afternoon commute, sometimes seeking help from transit agency “street teams” carrying bus schedules and laminated maps showing the new stops. The tunnel, previously used by both buses and light-rail trains, was permanently closed to buses over the weekend to make room at the north end for the expansion of the Washington State Convention Center and at the south end for work necessary to extend light rail to the Eastside. Seven routes that previously used the tunnel were permanently shifted to surface streets. Eight other routes already on surface streets were also moved. Transit riders can find all the affected routes and exact locations of new stops on King County Metro’s website. The Monday morning commute was largely uneventful. The afternoon provided the first real test of the new configuration as thousands of passengers boarded buses leaving downtown at the new stops. In total, the move adds 830 bus trips each weekday to surface streets, according to Metro. For most bus passengers, the change meant an extra block or two to find their new stop. Those used to boarding Sound Transit Route 550 to Mercer Island and Bellevue at the International District/Chinatown Station had a longer hike. Their new stop leaving downtown is about five blocks from the station. Drivers navigated a new bus lane on Fifth and Sixth avenues downtown, and new stops along Sixth Avenue were crowded with passengers whose stops had moved. Shortly after 5 p.m., several hundred people were waiting for buses at Sixth and Union. Kumar Gaurav waited on Sixth Avenue for a delayed Route 252 bus to Kirkland. Gaurav, who has taken the same route for 11 years, left work earlier than usual to try to avoid the crush of Monday’s changes. Still, the bus was about 15 minutes late. Timing matters for Gaurav, who has to pick up his daughter from day care in Kirkland by 6 p.m. If delays on the route persist, he may consider carpooling or asking his boss for an alternate work schedule. “A couple minutes adds up gradually,” he said. Nicole Larsen waited nearby for a Route 316 bus, which travels between downtown and Meridian Park. Her bus was running late too. Jeff Switzer, a spokesman for Metro, said delays of up to 15 minutes are not unusual during the afternoon commute. The agency did not yet have estimates for how much longer trips were taking through downtown. “This is going about as smoothly as could be expected given the magnitude of the changes,” Switzer said. To make room for buses, Third Avenue from Stewart Street south to Yesler Way and then along Prefontaine Place has been closed to cars during the day since last fall. Transportation and environment advocates with the Move All Seattle Sustainably (MASS) Coalition called on city officials to extend that transit priority north from Stewart Street to Denny Way to improve bus reliability. 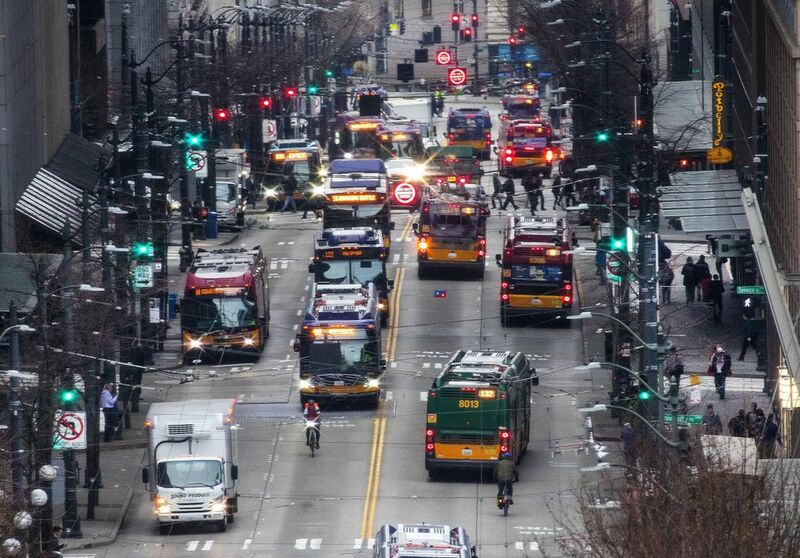 Seattle Department of Transportation Director Sam Zimbabwe said Monday the change is “not something that is required to keep buses moving right now,” but the city could consider it if Metro buses become less reliable in the area.